Buy 2 Cyclone for 65,00EUR each! Buy 3 Cyclone for 60,00EUR each! Buy 3 Cyclone for 75,00EUR each and receive ONE MORE for FREE! 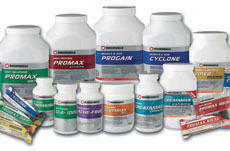 Maximuscle's Cyclone® is a superb product that delivers results you can feel within seven days. It supplies your body with a unique combination of whey protein and vital nutrients needed by your body to support muscle growth, strength and recovery while training hard. After intense training, Cyclone accelerates muscle refuelling, with faster recovery of glycogen stores than carbohydrates alone. No other formula on the market contains the potent combination of Biomax® whey, creatine monohydrate, glutamine, Suma extract (Beta-Ecdysterone), along with patent pending creatine and glutamine absorption systems specially created to deliver optimum results in conjunction with your weight training regime. Maximuscle’s Cyclone takes the confusion out of which products to take. Simply take 2 servings a day, one in the morning and one after training (or in the afternoon). The product has been specially designed to mix instantly with water without a blender, and comes in five great tasting flavours: Chocolate, Strawberry, Banana, Vanilla and Orange. Lactose, a sugar found in milk is a known cause of wind and stomach discomfort. Biomax whey contains only the barest minimum making it suitable for lactose intolerant individuals. You also won’t find low grade proteins, such as casein or soya protein, allowing you to enjoy your gains without experiencing stomach upsets, wind or bloating. Each daily serving provides 10g of glutamine and 10g of Maxpure creatine monohydrate, which research shows could increase muscle size and strength when combined with your weight training. Taken after intense training, Maximuscle’s Cyclone accelerates muscle refuelling with recovery of glycogen stores faster than carbohydrates alone. It also offers you 3000mg of HMB®, which independent research has shown helps prevent muscle breakdown following weight training. To further aid your muscle growth you get nearly 50g of advanced Biomax whey protein and an extra 10g of glutamine per daily serving, and also Beta-Ecdysterone, which is a natural extract of Suma and Brazilian ginseng plant, as used by Eastern Bloc strength and power athletes. 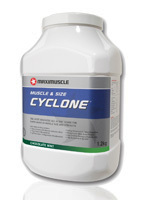 Maximuscle’s Cyclone is an excellent formula, with results felt within seven days. Mix 1.5 scoops (60g) of Maximuscle Cyclone with 350-400ml of water. Stir with a fork or mix in a Maximuscle shaker. Drink within 5 minutes. Take 3 scoops daily, 1.5 scoops in the morning and another 1.5 scoops after training or in the afternoon. Please note: Maximuscle owns HMB trademark.